How Many Calories Are in Tofu? Tofu is a product made from soy milk curdled with a coagulant known as nigari, or calcium sulfate, a natural mineral. Tofu is a staple of vegetarian diets as soy is the only complete plant protein. It is a low-calorie, low saturated fat protein option to include in any diet. You will find three types of tofu in grocery stores. Firm tofu may be diced or sliced into sturdy pieces that hold their shape in stir fries, soups or on the grill. Soft, or regular tofu, may also be cubed, and is often used in Asian soups like miso soup. Silken tofu is a custard-like version that may be added to smoothies or blended into casseroles. A 3.5-oz. 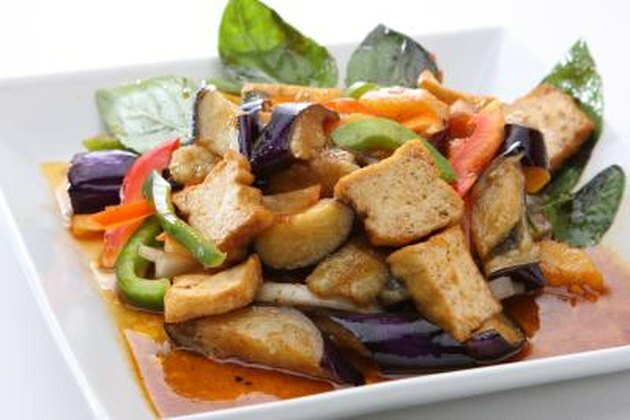 serving of firm tofu contains 145 calories. Regular tofu contains 76 calories per 3.5 oz. Soft or silken tofu is the lowest in calorie with 61 calories. Firm tofu contains 16 g of protein and 685 mg of calcium per serving. Regular tofu provides about half as much of these nutrients at just 8 g of protein and 350 mg of calcium. Silken or soft tofu provides the least protein and calcium at 6.5 g and 111 mg, respectively.